Many magazines companies use giveaways to help boost sales. Cosmopolitan Magazine is no exception. Branded items are used as on pack promo by Cosmopolitan such as Agnès B accessories box and Kiehl’s lip balm. 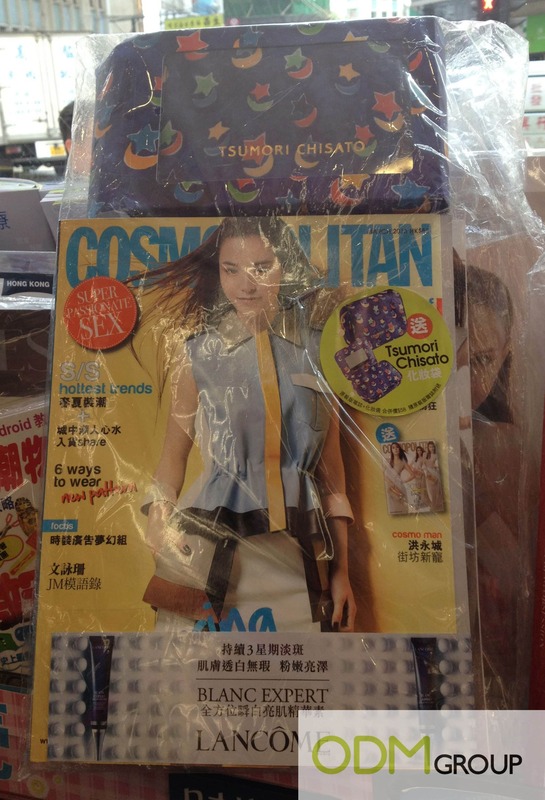 This time, they are offering Tsumori Chisato accessories pouch as on pack promo gift item when consumers purchase Cosmopolitan Magazine. This promotion was found in Circle K, a convenience store in Hong Kong. Read on to find out more about this promotion! Tsumori Chisato’s signature style was celebrated with her innovative and luxurious textiles, intricate beading, embroidery, appliqués and prints of her own design. Graceful, elegant and fun at the same time, Tsumori Chisato’s work has been greatly appreciated over the years. Her first freestanding shop outside Asia was chosen to be in Paris. How would branded promo gift boost sales? By giving out branded items as promotional gift to customers, it would definitely entice customers to purchase your magazine. The promo gift acts as an incentive to customers, attracting them to purchase your magazine even though they might not be interested in reading magazines. Practical items would be perceived more highly by consumers. Certainly, this accessories pouch would be useful to the women, to store their accessories or even make up. They can also bring the pouch when they go out and place it into their handbag without any hassle. This helps in organizing their stuffs, as women tend to misplace small items such as their lipstick, mirrors, combs, etc. Furthermore, this accessories pouch has a mirror at the flap. This way, they need not bring their own mirror out, saving on space and weight. Cosmopolitan can brand their company name at the side of the accessories pouch to boost brand awareness. When users carry this pouch around, other people would be able to notice the brand logo on it. Brand loyalty could even be enhanced in the long run. Get your very own branded promotional items for your customers as giveaways right now!